In April and May, National Public Radio featured a series on inexpensive gourmet dishes entitled “How Low Can You Go?” Although many of the dishes looked quite tasty, most of the dishes weren’t actually all that inexpensive, often narrowly getting below $10 to feed a family of four, and many involved arduous cooking processes. I decided to try out some of these recipes throughout the summer to see how I could take the recipes and reduce them down to a simple and very inexpensive form. My wife Sarah took charge of this recipe, so my notes below are largely taken from her comments as she was making it. First of all, here are the ingredients we used. We wound up using Dole spinach for this because the spinach we got at the farmers market (our usual source for summer produce) was utterly abysmal – the two purveyors had some of the saddest looking spinach we’d ever seen, so we passed. The rice – a mix of white and brown long grain – was pre-cooked a day in advance. 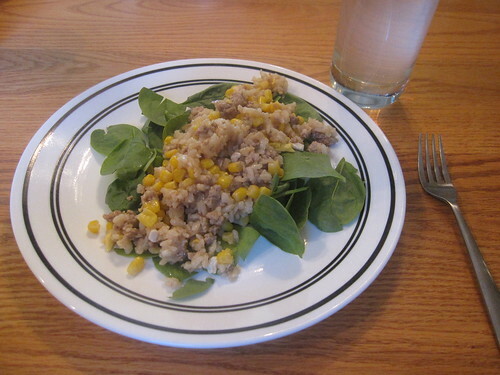 We also chose to substitute some ground turkey for the ground chicken, because that’s what we had on hand. Sarah suggests spicing the meat quite a bit here by putting on plenty of pepper and I agree wholeheartedly – black pepper really complements things well. After the eggs were finished, she cooked the other ingredients together in the remaining oil. 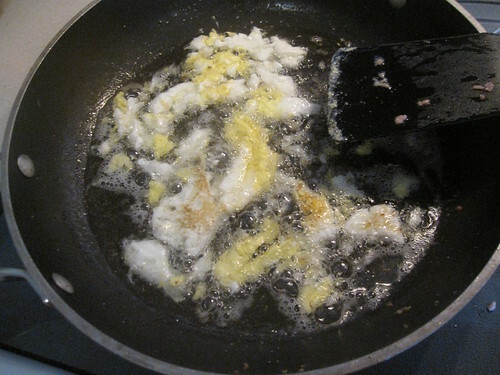 A quick note: she decided that there was an excess of oil after the eggs finished and removed most of the oil. I agree – I think with that much oil, there would have been too much in the pan. Half an inch might be the right amount in a wok, but not in a large pan – use just barely enough to cover the pan (once the eggs are done). Upon adding the rice, the turkey, the eggs, and the corn to the mixture, there was a huge amount of food, filling up our rather large pan. It smelled heavenly at this point. I (personally) suggest adding a bit more soy sauce than what the recipe calls for, but it was quite good as-is. Did we like it? Almost universally, yes. Even our son, who is the pickiest eater in the house, seemed to really get into it, gobbling it down like crazy. Both children had seconds, though neither one finished their second helping. I loved it, though I would have included just a bit more soy sauce. Sarah loved it, too, though she’s intrigued as to whether it would be significantly different with chicken. What about the cost? Our cost for this recipe totaled $9.80. But here’s the kicker – there was more left over than we consumed at the table. We were able to get eight more meals out of the fried rice, for a total of twelve meals. Thus, the cost per meal was $0.81 – not bat at all. Still, if you’re eating for a small family and don’t want to eat this four times, you should reduce the recipe significantly. The first thing I would do is halve the recipe. The recipe makes a mountain of food and, unless you want to eat it several times or have an enormous family, it makes too much food and the rest will go to waste. One could freeze it, I suppose, but the dish does not strike me as one that would tolerate freezing well. The second thing I’d do is reduce the oil. This doesn’t change the time, but it slightly reduces the cost and definitely improves the health of the meal. You don’t need half an inch of oil here unless you’re using a wok – even then, it’s perhaps too much. Third, de-stemming the spinach seemed flatly unnecessary to us. 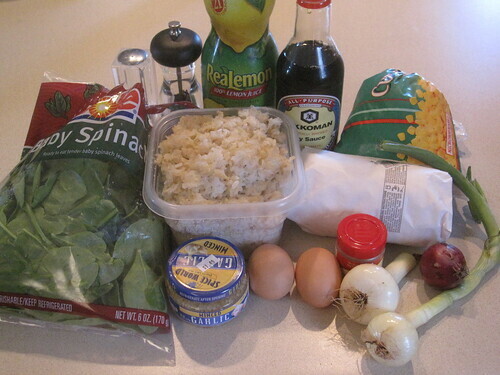 It would be a time investment that doesn’t gain too much – the small stems on most spinach is just fine. We served ours just as it came, after washing. Heat a wok or large saute pan over medium-high heat. Lightly coat with oil. When oil shimmers add chicken, season with salt and pepper, and brown, breaking up any large chunks with wooden spoon or spatula. Remove chicken to a plate. 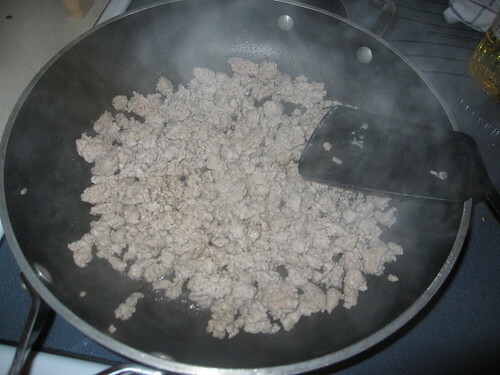 Add about 1/4-inch oil to wok (unless using pan, then just coat bottom) and allow to heat; add eggs, which will puff up. Cook scrambled eggs and remove to a paper towel-lined plate. If necessary, add more oil to wok to lightly coat, then add onions, garlic, and powdered ginger, and cook until nicely caramelized, about 5 minutes. 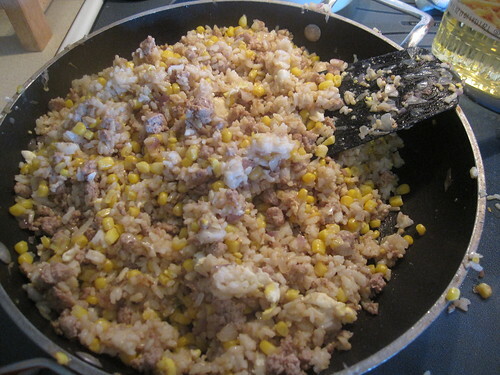 Add corn, rice, chicken and egg, and toss to combine. Add naturally brewed soy sauce, toss to combine, and check for seasoning. Place mound of raw spinach in center of four dinner plates. Drizzle with lemon juice and season. Top with fried rice to cover. Enjoy!